I see a core charge on my order - what is this? A core charge is a refundable charge that is added by BMW to the price of a re-manufactured or exchange product as BMW wants the old unit returned. They'll often re-use/re-build a new unit with the returned core. Typically - core charges are added to items like BMW engines, transmissions, alternators, high-pressure pumps, driveshafts, power steering pumps and racks, starters, etc. When purchasing one of these parts through our site, you'll see the core charge added, and you'll pay the full price of the item plus the core charge. You'll then be reimbursed the core charge when you send back the old unit you're replacing. Please be sure to return the part clean and drained of any fluids, in the same BMW box the new part comes in, with all labels, packing material, etc. Like our flexible 120 Day Return Policy, we ask that BMW cores are sent back for credit within 120 days. The underlying idea behind a remanufactured part is recycling: up to 60% of parts can be re-utilized at the end of their specified lifetime. Yet every exchangeable part is subject to exactly the same quality specifications as a Genuine Original BMW Part and it even carries the same 24-month/unlimited warranty. 95% of all parts that cannot be directly refurbished are recycled, and these figures make sense: not only for the environment but for your pocket as well – BMW Remanufactured Parts cost up to 50% less than the new component. 1. Request an RMA # through our Contact Us form here, selecting "Return Request" as the reason. Please include your order # and part # of the core. We'll quickly email you an RMA # that you'll use to send back your core in the same BMW box the new unit came in. Please include a copy of your invoice, packing slip, or order confirmation, and be sure to securely package the shipment, and drain all fluids from the core (if applicable). Return shipping charges for cores are your responsibility - we recommend using a shipping carrier that provides tracking/delivery information. We unfortunately can not apply a core credit if the core doesn't make it back to us. 3. Once returned, please allow 5-7 business days to process your core return and apply the credit to your original payment method. It can take many business days for the actual credit to post to your account depending on your bank. Please monitor your bank statement or PayPal for the credit to post. If we are unable to credit the original payment method, our accounting dept. will mail a check. Please let us know if your mailing addresses changes. Front and rear bumper covers for select models will now have a core charge/deposit assigned to them. A 6" x 10" section of the old bumper must be cutout and returned to us to get back the core charge/deposit. 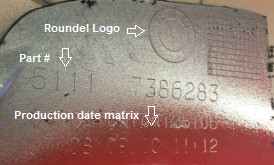 This section of the bumper cover must be the portion that includes the BMW Roundel logo, part number, and production date matrix. The location of this information will vary from model to model. Do not return the entire used bumper cover. Once cutout, please request a core return RMA # as instructed above, and then return to us at the address indicated. You must also include the last 7 digits of the VIN # with the return (ie. on a copy of the invoice, packing slip, order confirmation email, or just write it on a piece of paper).